Over the last months, Kohei Yoshino and myself worked on improving the discoverability of Firefox Nightly desktop builds and in particular localized builds. Until recently, the only way to get Firefox Nightly for desktop was to download it in English from nightly.mozilla.org or, if you wanted a build in say Japanese, Arabic or French, look for the right FTP sub-folder in ftp.mozilla.org. Nightly.mozilla.org is itself a static HTML page based on a script that scraps the FTP site for builds periodically. Of course, as a result, about 90% of our Nightly users use an en-US build. The few thousand users using a localized build are Mozilla localizers and long term contributors that knew where to search for them. We were clearly limiting ourselves to a subset of the population that could be using Firefox Nightly which is not a good thing when you want to actually grow the number of nightly users so as to get more feedback (direct and anonymous). 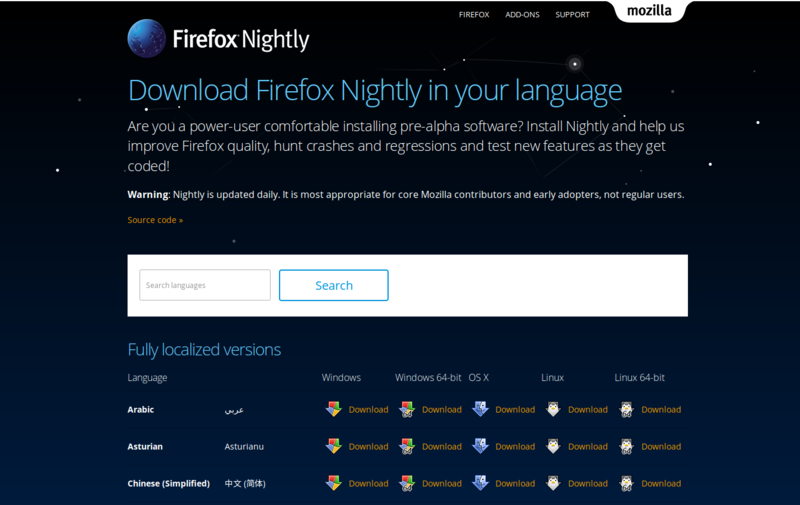 The situation was so frustrating to some of our community members that they created their own download pages for Nightly in their language over time. Then why didn’t we have a proper download page on www.mozilla.org as we do for all Firefox channels (release, beta, dev edition) ? Why are nightly builds available only from a separate sub-domain? One of the reasons was technical, www.mozilla.org uses data provided by the Release Management team through a public JSON API called product-details and that API didn’t provide any information about Nightly. Actually, this API was a typical legacy piece of code that had been doing the job well for a decade but was meant to be rewritten and replaced by another tool year after year. Until the switch to a new compatible API and the addition of Nightly data there, mozilla.org just didn’t know anything about Nightly. So first we had to actually end the work on the migration from the old to the new API and mozilla.org switched to this new API in August. We are working on making that page linked from the nightly site in bug 1302728. That’s only a start of course, we still have a lot of work to make it easier for advanced testers to find our pre-release builds, but now when somebody will ask you for a comprehensive list of Desktop Nightly builds, you’ll know what address to share! Many thanks to Kohei and the mozilla.org Webdev team for their help on making that happen! GREEK (el or el-GR) is NOT included in the available l10ns! a Greek localisation of Nightly is urgently needed! Another person you could contact is Francesco Lodolo (flodolo@mozilla.com), he manages localization for Firefox. is involved, especially for the Nightly channel. It would be great to be able to download firefox for Android too from this page.